Whats black and white and clawing its way onto your reading list? Its the newly resurrected Creepy, of course! 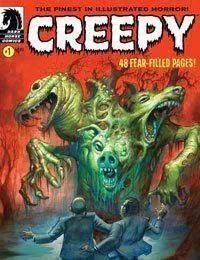 Now, dont fret, my putrid pets--these new terror tales are cut from the same cursed cloth as the outlandish originals, telling contemporary horror stories with gorgeously ghoulish art from a lineup thatll make you lose your head! Original Creepy artist Angelo Torres teams up with devilish Dan Braun on Hell Hound Blues; Michael Woods and artist Saskia Gutekunst serve up a dose of Chemical 13; Neil Kleid and Brian Churilla provide All the Help You Need at a weird weight-loss camp; and jaundiced Jason Shawn Alexander brings his phenomenal painting skills to Joe Harriss The Curse! Plus Bernie Wrightson, the return of Loathsome Lore, and more. All this, plus one classic story from Uncle Creepys dank dungeon, and youve got 48 freakish pages of terror to bring home to mummy!